All back issues of "From the Desk..." can be accessed by clicking here. Yes, it's true … if you're investing in bonds or CDs you will get a very low return on your money. Most of our readers, however, are entrepreneurs and have a different motivation. Like you, they're relying on their own efforts and abilities in their pursuit of building a viable business. Such action is especially important these days with the historically low investment yields. In conjunction with the building of your business, keep uppermost in your mind the value of focusing on one of the most profitable types of investments available — your bartering efforts. When you are doing business through your trade exchange, you're acquiring other needed products and services at your low variable cost, which is one of the most efficient ways to push ahead financially. If your barter company's listing on BarterNews.com isn't current, you are definitely missing out on new business. 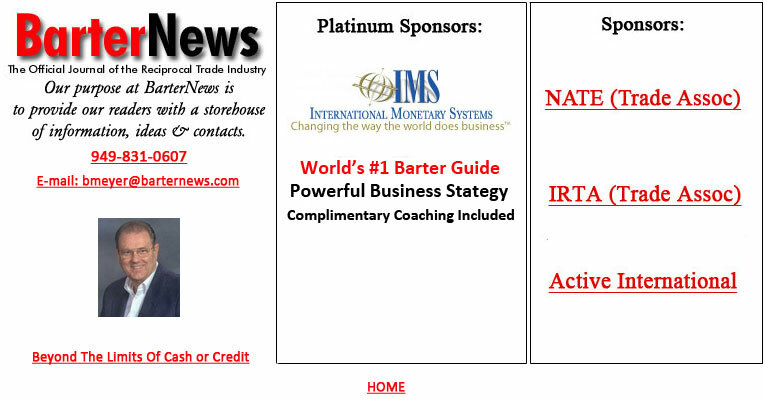 The web site BarterNews.com receives heavy traffic — with over 150,000 page-views every month. Entrepreneurs and corporate executives check the thousands of articles, the weekly "Tuesday Report," and the "Contacts Section" of our site. They use the latter to find barter companies with which to do business. Is your barter company's listing up-to-date? To keep your listing current is very easy. See the links below to (A) update any changes to your company's listing, such as new location, phone number, web site or other information, and (B) if your company has not been listed. We have packages of back issues still in print, approximately 30 issues in all. The process of organizational change is complex. A number of associated factors have the ability to impact an organization's overall ability to successfully evolve. Improper development, management, and monitoring can result in the change-process spinning out of control and creating chaos. In the center of this storm, it is the leader who must then wrestle control of events and restore order. As individuals are making the shift from a management to leadership style, the entire workplace is being buffeted by change. The leader is no longer controlling the employee's actions, but guiding and directing them through involvement and empowerment. Properly executed, this should be a smooth transition. However, ill-conceived plans implemented by poorly prepared leaders and employees can turn the entire process into chaos. Most organizational changes do not transpire quickly. Typically, organizations and leaders both evolve together as they transition from one style of management to the other. Leaders grow through the persistent application of leadership ideas and concepts, as well as development of their skills. The process is without an ending point, and continually moves forward over time. Leaders who find themselves in the midst of a process that has swirled out of control, must not be swept away by the tide of events and circumstances. If they are, they will give up the ability to remain detached and view what is happening objectively. This can be challenging, as they must regain control while dealing with the daily demands and pressures of the job. Because of this they must understand that they are staring down a complex and often daunting task. For the leader in these circumstances, the first step is to retain or regain emotional control and then proceed dispassionately. It is simplistic to think a single cause of a complex problem can be identified. Most problems are caused by ever-widening and overlapping circles of circumstances and events. What appears to be an obvious and clear-cut cause is often only symptomatic of a much deeper problem. When events appear chaotic, the problem can stem from more than one area and each has to be addressed in turn. In certain instances the leadership role was thrust upon an individual lacking the aptitude and confidence to fulfill it. Once in the position, they fail to lead and are unable to manage due to the organizational change. Consequently, they leave a vacuum that is filled by disorder. In other instances, the leader may be new and inexperienced and thus attempting to accomplish overly ambitious goals and objectives. Rather than evolve, they are pushing change too fast, or expecting too much of their employees. When the process seems to be collapsing, the employee's role must also be examined. In certain instances employees did not receive adequate training to fulfill the roles expected of them. In other cases, too much is expected of employees too quickly. They are immediately overwhelmed and unable to deal with the circumstances. A lack of employee involvement and empowerment in the process can cause major setbacks. Their lack of input and feedback does not foster the ownership of ideas and participation. Consequently, they may have perceived too high a personal risk, which created resistance. Since their involvement is essential, this created a void that was quickly filled with chaos. Consideration must be given to whether the plan, underlying the process itself, may be flawed. This can happen for a variety of reasons brought about by both the leader and employees' participation (or lack thereof) in its development. Motivation, beliefs, resistance and lack of skills and/or experience, can give rise to a poorly conceived plan. Typically, such problems associated with either leadership's or employees' role in the process will impact the overall plan. Ill-conceived timing and timetables can wreak havoc. Inexperienced leaders might not be aware of the impact of certain implementation-dates on the organization. Additionally, attempts to accomplish too much too fast can overwhelm the entire organization. In certain instances, management can undermine their own efforts by micromanaging the process and issuing counterproductive dictates and mandates. In other circumstances employees might not trust the motives of the company, due to past experiences and existing policies. Lack of management and financial support of the process undermines employees' ability to accomplish their goals and objectives. Without proper support, leaders' efforts will be severely hampered. Astute leaders should enlist the assistance of key influencers within their employee pool. These are the natural leaders who have the ability to persuade others and enlist their support. If these individuals are sold on the idea of change, and understand that the benefits more than offset the risks associated with change, they will be able to convince others within their ranks of the same — thus making the leader’s job much easier. Our street-smart restaurant marketing report shows proven ways to rapidly boost your restaurant's sales & profits. There are many forms of secondary capital — which can be defined as any financial instrument that measures and communicates value in a common language. Would you like to see and learn more about the many forms of secondary capital? We have 70 free, informative and inspiring, articles for you in our "Secondary Capital Section." Copyright BarterNews 2015. Redistribution of BarterNews content expressly prohibited without the prior written permission of BarterNews.